This particular character is inter4sting, but I don't think it's complete yet. I got it from the Infinity Mugen Team website quite a while ago and I have never noticed an update for it. 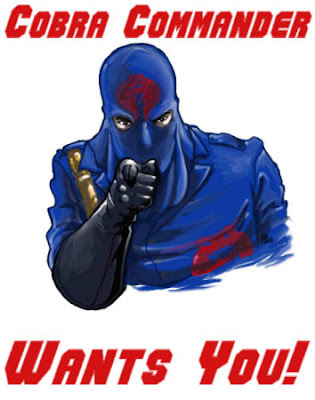 Cobra Commander was running a terrorist organization before anyone on the US really knew what terrorism is. I mean GI Joe was very ahead of its time in the mid-1980's. Cobra Commander's faction was called Cobra asnd to be honest I think he was modeled after Hitler and the Nazis. I mean Cobra's goal is to conquer the world - nothing less. I know there are many fictional characters with similar goals, but who has come up with some of the best ideas ever in order to do it? 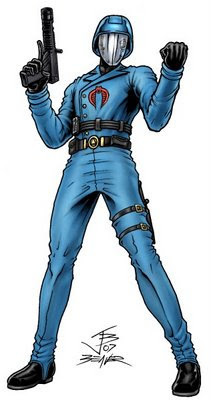 Cobra Commander. He always manages to escape and set up elsewhere. Where does he find the money, time and people that he has working for him? Here is a video I made showing the version of the character that I found in MUGEN. Download.